Here is a list of the various camps that are featured in this exhibition, only a small portion of the total number of camps that were constructed. Labour camps: concentration camps where interned inmates had to do hard physical labor under inhumane conditions and cruel treatment. Some of these camps were sub-camps of bigger camps, or "operational camps", established for a temporary need. Extermination Camps: These camps differed from the rest, since not all of them were also concentration camps. Although none of the categories is independent, and each camp could be classified as a mixture of several of the above, and all camps had some of the elements of an extermination camp, systematic extermination of new-arrivals occurred in very specific camps. Of these, four were extermination camps, where all new-arrivals were simply killed – the "Aktion Reinhard" camps (Treblinka, Sobibór, and Bełżec), together with Chelmo. Two others (Auschwitz and Majdanek) were combined concentration and extermination camps. Others were at times classified as "minor extermination camps." 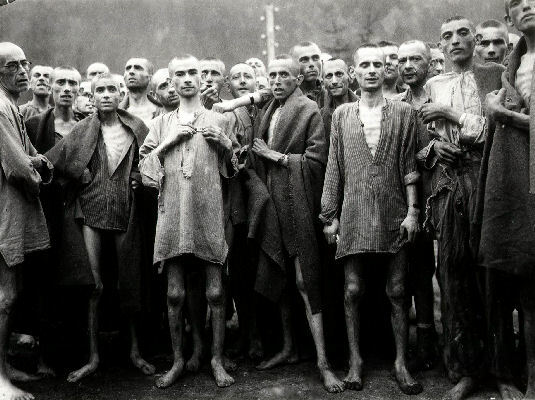 Starved prisoners, nearly dead from hunger, pose in concentration camp in Ebensee, Austria. The camp was reputedly used for “scientific” experiments. It was liberated by the 80th Division. May 7, 1945. Ebensee camp was a subcamp of the Mauthausen concentration camp. Lt. A. E. Samuelson. (Army). Credit: NARA. 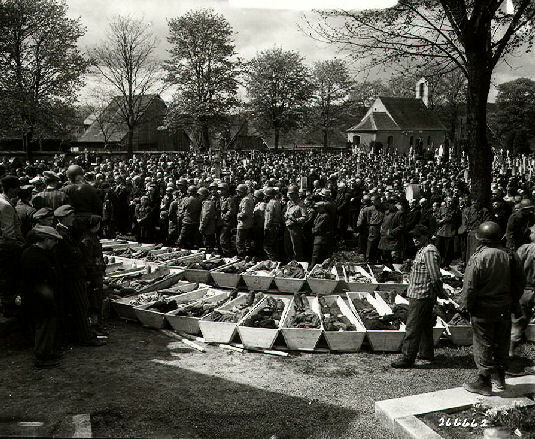 Chaplains of the U.S. Third Army conduct burial services for the 120 Russian and Polish Jews, victims of SS troopers’ killing in a wood near Neunburg, Germany. April 29, 1945. Pfc. Wendell N. Hustead. (Army) Credit: NARA. Camps featured within this exhibition are listed below.